The UK tank test simulates the leaching of components from monolithic waste to test for suitability for disposal to landfill. Monolithic waste is waste that occurs as large blocks or large masses of concrete. This includes solid material such as concrete, glass, rubber or timber which may contain hazardous waste material. Current EPA methods for leaching of components are focused on soils which are not always relevant. 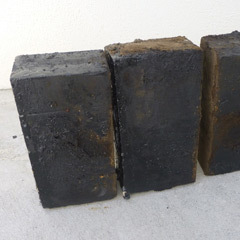 Leeder Analytical was provided with timber blocks which were categorised as Category A waste and were requested to conduct the UK tank test for Monolithic waste to determine if it meets landfill waste acceptance criteria. In accordance to the UK tank test, the entire samples, test control samples and system blanks were placed into the leaching solution under controlled laboratory conditions. The leach solutions were changed over at predetermined time intervals. Leeder Analytical provided leach data on the rate at which target compounds were released from the monolithic waste. UK tank test leaching is a 64 day leach test in which the leach solution is changed at different time intervals in order to determine the rate of release of contaminants from the waste being assessed. EPA solid waste guidelines for ASLP. The data generated from the 64 day UK tank tests confirmed that the timber coating was non reactive, has a water proof coating and produced minimal leachates. Results submitted to the EPA resulted in re-classification of the coated wooden blocks, as the results did not exceed the Vic EPA Category B, C or industrial waste ASLP limits. This leaching procedure has also been used to assess leach rates for PFOS from concrete slabs.